In the articles Implementing Store and Forward Messaging Patterns With WSO2ESB Part 1 and Implementing Store and Forward Messaging Patterns With WSO2ESB Part 2 . I have introduced WSO2 Message Processors and Message Stores and explained how to implement store and forward messaging patterns with them. In this blog post i ' m trying to show how to implement a redelivery messaging pattern i recently implemented. actually in the article Implementing Store and Forward Messaging Patterns With WSO2ESB Part 2 i have described how to implement a redelivery pattern with Message Forwarding processor. But in this post i'm going to show how to implement another redelivery pattern which can’t be achieved with Message Forwarding processor. Client invokes a Backend service through a ESB. If 1st invocation is successful send the response back to client and if service is not available send a fault message back. Lets see how we can implement this using WSO2 ESB. For this i’ll be using WSO2 ESB mediation sequences , Message Stores and Message Processors. If we look at how WSO2 Mediation constructs are designed. They are designed in a matter that that they act as set of mediation building blocks using which we can compose different EIP/Messaging patterns. So in this scenario we will be composing sequences , mediators , Message Stores and Processors to build this messaging pattern. Proxy service accepts the Message and Send message to SendToServiceSeqeunce. Clone the message and in one clone thread we create a fault message and send back to the client. In the other clone thread we add property: retry_count to 1 and store the message. We check if the retry_count > N if that is the case we drop the message if not increment retry_count using a xpath function and store the message. Note : Here MessageSampling Processor is configured to poll messages from Message Store in every T time interval and send it to SendToService sequence. Following is the Flow chart of the above described Message Flow. 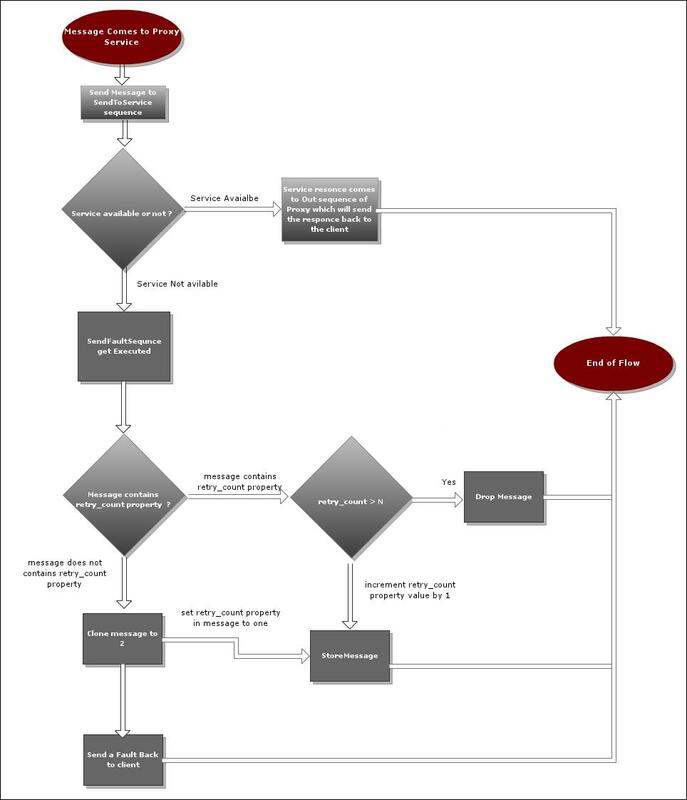 And Below is a Sample ESB Configuration XML which implements this. For this i have used the SimpleStockQuoteService as the Backend service which is comming with WSO2 ESB Samples. In this configuration it drop the message after N retries but we can use store mediator and store it in another message store in need.